Aims: This study was to determine the severity of the tandoor burns in a city in Eastern Anatolia and to attract attention for the prevention of tandoor burns. Subjects and Methods: A retrospective evaluation was made of the registration data of burns hospitalized. A record was made of patient variables including burn type, age, gender, socioeconomic status, and amputation site and level. Statistical Analysis Used: Descriptive statistics were used to summarize the data, and results were reported as number and percentage. Categorical variables were evaluated with the Chi-square test. P < 0.05 was considered statistically significant. Results: To emphasize the importance of tandoor burns, the data were classified as tandoor (8.8%) and other types of burns (91.2%). Tandoor burns were the fourth-most common cause of burn. While the rate of amputation in other burn types was 1.26%, the amputation rate was 9.09% in tandoor burns. In the 0–3 years of age group, the percentage of tandoor burns was significantly higher. In respect of tandoor burns, more amputations were performed on children than on adults. Conclusions: Tandoor is used in many places in the world for various purposes (as sociocultural habits, cooking, and warming, especially in low-socioeconomic areas). Increasing protective measures in the use of tandoor may be useful for reducing the amputations due to tandoor burns and its possible long lifetime consequences. Because, unfortunately, tandoor burns are a significant cause of amputations in children-foot amputations in particular. The long-term consequences of burns, such as contracture, amputation of extremities, and the development of contractures in the extremities are common in the long term after tandir burns., Female patient with contracture in the right axillary region due to tandir burns. Representative preoperative and postoperative picture of contracture of the axillary region who made multiple Z-plasty [Figure 1]. The importance of taking preventive measures against tandoor burns in adults and children need to be seriously evaluated in Eastern Anatolia. Therefore, this study was designed to assess the etiology of burns requiring hospitalization and the frequency of burn-related the relationship between burning causes and hospital stay, and clinical course, and amputations in a city in Eastern Anatolia. The results may help health-care workers to be aware of the necessity of taking regional measures for burn victims and providing groundwork for longitudinal studies. This study received approval from the Human Research Ethics Committee of our Hospital (dated April 4, 2015, and numbered 2015/3). A retrospective evaluation was made of the registration data of patients with burns from any cause, who presented at the Emergency Department of our teaching hospital and underwent inpatient treatment between October 2008 and January 2015 (excluding January 2015). After exclusion of 84 cases with incomplete burn-related health records, an examination was made of the records of 1993 burn patients who were hospitalized and treated to the burns service of our hospital. This burn service accepts patients from the major cities of Eastern Anatolia, with a catchment-area population of at least 2 million. The variables of burn type, source of burns, age, gender, socioeconomic status, duration of hospital stay and location of burns, surgical treatment, amputation site and level, and mortality rates were recorded for each patient. The duration of hospital stay was classified as days, including the days of admission and discharge. The socioeconomic status of the patients was categorized into three groups: monthly income <400 USD, monthly income 400–800 USD, and monthly income >800 USD. Causes of burns were divided into eight groups as follows: scald, electrical, contact, chemical, tandoor, cold, lightning strike, and flame burns. In some studies, tandoor was not taken as a different group, because the use of tandoor is not common worldwide. The traditional tandoor ovens continue to be used in the Eastern Anatolia region of Turkey and in parts of the central Anatolia regions for cooking, baking bread, heating water, and heating the home. Regional factors, climatic and economic conditions, and traditions have maintained the tandoor culture into the present. There are also regions where the oven is situated on either an earth base or at a certain height above the ground. Representation of a tandir located in a kitchen in a village of Eastern Anatolia in Turkey [Figure 2]. Statistical analyses of the study data were performed using IBM SPSS Statistics 23 for Windows (IBM SPSS Inc., Armonk, NY, USA). Descriptive statistics were used to summarize the data, and results were reported as number and percentage. Categorical variables were evaluated with the Chi-square test. P < 0.05 was considered statistically significant. 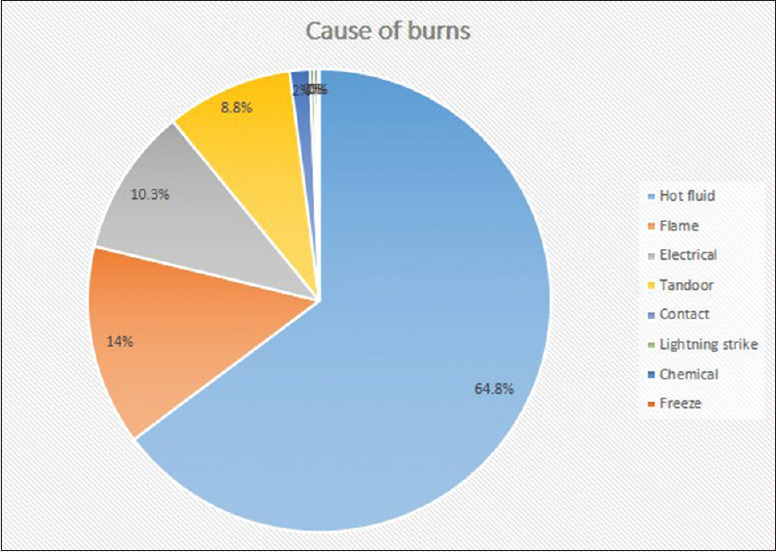 When the causes of the burns injuries were examined, the most common causes of burns were hot liquids (n = 1291 [64.8%]). The other causes, in order of descending frequency, were flame (n = 279 cases, [14%]), electricity (n = 206, [10.3%]), tandoor (n = 176, [8.8%]), and contact with hot surfaces or materials (n = 28, [1.4%]), lightning strike (n = 6, [0.3%]), chemical (n = 5, [0.3%]), and freeze burn (n = 2, [0.1%]). The factors leading to burns are shown in [Figure 3]. To emphasize the importance of tandoor burns, data were classified as either tandoor burns (n = 176 [8.8%]) or other types of burns (n = 1817 [91.2%]). The demographic and selected clinical variables of burn patients hospitalized between October 2008 and January 2015 are presented in [Table 1]. The mean age was 10.78 years, with a range of 1 day–84 years. Tandoor and other-burn types were evaluated according to age groups, and the highest rates were determined in the 0–3 years of age group for tandoor and other burn classifications (64.8% vs. 51.4%, respectively). More female patients were observed the tandoor-burn group and more male patients in the other-burn-type group (52.3% and 59.1%, respectively). Significantly, female patients with tandoor burn were more than were with other burn types female patients (P < 0.05). For all burn types, the percentage of patients with low-socioeconomic status was higher than that of patients with other socioeconomic statuses (96.6% vs. 54%, respectively). Moreover, a higher rate of patients with low socioeconomic status had tandoor burns than other burn types (96.6% vs. 54%, respectively; P < 0.05). Fewer patients with moderate socioeconomic status sustained tandoor burns than burns of other types (2.8% vs. 31.5%, respectively; P < 0.05). Similarly, the percentage of tandoor burn patients with high socioeconomic status was lower than that of other burn types (0.6% vs. 14.4%; P < 0.05). A total of 530 patients (26.6%) had burns to the lower extremities and pelvis or only the lower extremities; hot fluids were the most common causes of these burns (n = 382 [72.1%]). Totally 366 patients (18.4%) had burns only to the upper extremities and hot fluids were the most common causes of these burns (n = 227 [62%]), 156 patients (7.8%) had burn injuries only to the head-and-neck region, 3 patients (0.2%) had burn injuries only to the genital region and hot fluid were the cause of all of these burns, and 681 patients (34.2%) had burn injuries to multiple regions. While the most frequent cause of burns in all body regions is the hot liquids, amputation rate is 11.3% extremity burns caused by tandoor; amputation rate is 1.8% extremity burns caused by other types; this difference did reach statistical significance (P < 0.05). Tandoor burns accounted for more amputations in children (0–16 years) (68.7%) than in adults (P < 0.05). In patients with tandoor burns, foot amputations were found at a higher rate than were either hand or both hand and foot amputations (50%, 18.7%, 31.3%, respectively). A patient who amputated to both toes with deep burns due to tandoor burn in [Figure 4]. In patients with other-burn types, the percentage of hand amputations was higher than those of foot and hand and foot combined amputations (43.5%, 30.4%, and 26.1%, respectively). 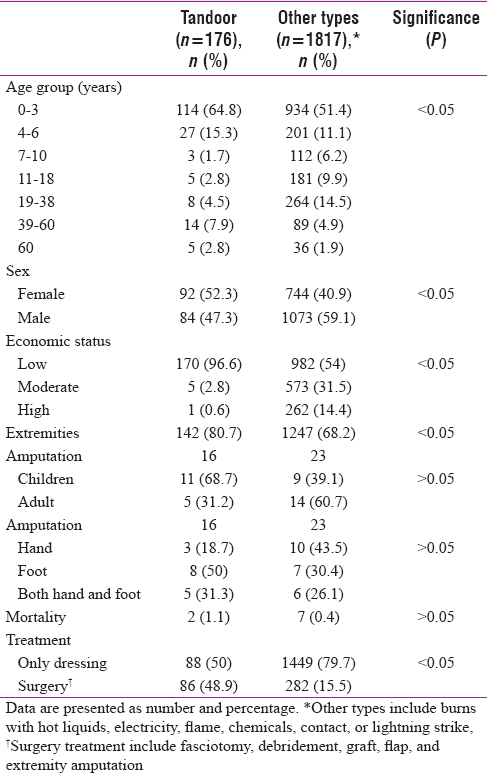 A higher rate of foot amputations was performed following tandoor burns than were hand amputations; however, because of the low sample size, this difference was not statistically significant (P > 0.05). The mortality rate is 1.1% caused by tandoor burns; the mortality rate is 0.4% caused by other burn type (P > 0.05). The treatment of the tandoor and other types burn injuries in patients had used only dressing including silver sulfadiazine, nitrofurazone, net dressing containing silver, and others (50%, 29.7%, 19%, 1.3%, respectively). The number of patients treated with dressing alone was significantly higher in the other burn type group (P < 0.05). Surgery treatment including fasciotomy, debridement, graft, flap, or extremity amputation in the tandoor burns was significantly higher from the other burn type group (P < 0.05). A patient who with contracture developed in the foot fingers and done partial thickness skin graft after tandir burn is shown in [Figure 5]. The duration of hospital stay was examined according to the causes of burns. Tandoor burns require longest hospitalization (mean 15.63 days). Duration of hospital stay was in order of descending days flame, contact, electricity, hot liquids, lightning strike, chemical, and freeze burns. The length of hospital stay based on the cause of burns is shown in [Figure 6]. In this retrospective study, all burn causes, especially tandoor burns, were evaluated in patients with burn-related amputations in Eastern Anatolia. The most common causes of burns were hot liquids. The other causes, in order of descending frequency, were flame, electricity, tandoor, and contact with hot surfaces or materials, lightning strike, chemical, and freeze burn. The highest rates were determined in the 0–3 years of age group for tandoor and other burn classifications. There were more female patients with tandoor burns, since bread baking, housework, and cooking are carried out by women traditionally. According to findings of this study, while the most frequent cause of burns in all body regions is the hot liquids, amputation rate was higher rate of the tandoor burns. In addition, although the incidence of overall amputations performed was only 2% of the 1993 patients studied, this rate was 8.8% in tandoor burn patients. A statistically significantly higher rate of tandoor burns in the 0–3 years of age group. For both tandoor and other-burn types, the highest incidence rates were also found in the 0–3 years of age group. A higher percentage of female patients sustained tandoor burns than other burn types. A statistically significant percentage of both tandoor and other burn-type patients had low-socioeconomic status. In the tandoor burns group, amputations were performed more often on children than on adults, and a higher rate of these amputations was foot related than hand related. The decision to amputate can be life-saving, even though it is a devastating procedure for a patient; therefore, such a decision is only made with the aim of improving a patient's overall condition and providing the best chance for survival. In the literature, amputation rates have been reported as ranging from 10% to 68%. However, the majority of studies have investigated high-voltage electrical injuries and fire burns.,, However, tandoor burns were the most common cause of amputation in all burns in this study (9.9%). In a study, the most common mechanism of injury was electricity (51.2%) followed by hot crush (14.6%). In a recent retrospective study, most patients (67.2%) were injured in work-related circumstances. Amputations were performed in 107 cases (18.0%) and were primarily of hands (43.9%) and upper limbs (39.3%). In industrialized regions, electrical burns are a major cause of amputation, and although amputations following electrical injuries are not common. Traditional daily activities in Eastern Anatolia can be the reason for the different kind of burn injury found here. Most people in rural areas use tandoor for cooking and heating the home. The lack of protective guards around a tandoor is a potential cause of fire- and high-temperature burns for persons falling into it, especially children. A child may fall into the tandoor for several reasons, such as running around it carelessly while playing, looking into it out of curiosity, and getting too close to get warm. Adults may fall because of fatigue, smoke, or high temperature, while they are cooking and baking with the tandoor. Body parts generally burned in a tandoor injury are the head and upper extremities. When the fire of a tandoor is active, burns sustained are generally deep second-degree or third-degree burns [Figure 7]. In the pertinent literature, several studies have emphasized that increasing family awareness about burns and their consequences are the most significant factor for decreasing burn cases.,,,,, In the current study, we found that the most common cause of burns in children under the age of 6 years was hot liquids and that the rate of tandoor burns in this age group was significantly high. By educating families, along with the use of a cover on an earth-based tandoor or the installation of protective guard around it, the high rate of amputation caused by tandoor burns could be reduced. Data obtained retrospectively from patients in South Africa, in China, and in Turkey, burns were reported most commonly in the pediatric age group, and the most common burn agents were hot liquid, fire, and electricity.,, In our study, the results related to the most common causes were similar to that observed in other studies. The current study was conducted in the province in Eastern Anatolia. The findings we obtained are consistent with those of similar studies in the literature.,,, However, in other studies, there is almost no mention of tandoor burns as a prevalent cause of burns, particularly in children. Children can fall in because of carelessness, and deep burns can result. In a study conducted in Samarkand, Uzbekistan, the traditional use of a “sandal,” a tandoor-like stove, was reported to be the cause of deep burns that extended as far as the subcutaneous tissue, particularly in children. This study also reported that, with the use of modern heating systems, the incidence of sandal burns had decreased by 93% when 2010, data were compared with those from 1990. 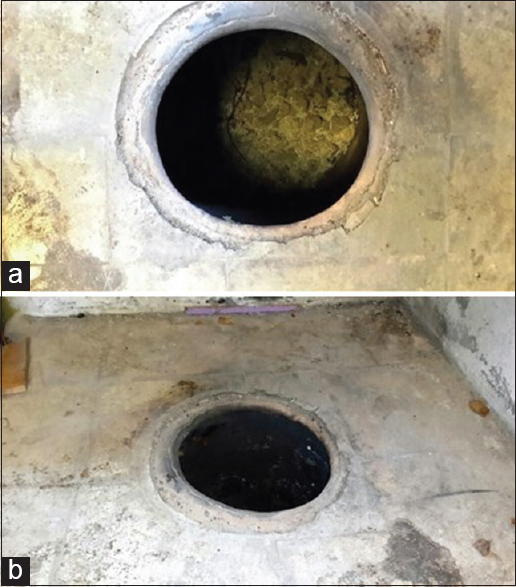 In a study conducted in Erzurum in Eastern Turkey, tandoor burns were reported to be deeper burns than those from other causes, and it was stressed that, during treatment of burns and their sequelae, a patient will require several operations. Moreover, physical, psychiatric, and psychosocial problems were seen more often in cases of deep burns., A previous multi-center study in Eastern Turkey compared tandoor burns with other burns and reported that burns resulting from a fall into a tandoor were deeper and impacted a more extensive surface area than did other burn types. These burns resulted in longer stays in hospital and higher costs than did burns of other types. This is because tandoor burns are caused by falling of patients into the tandoor pits and remaining in direct contact with overtemperature, especially the extremities, for long periods, resulting in deeper and more extensive burns, since it is not easy to go out of tandoor pit. Tandoor use is one of the important traditions in the Eastern Anatolia region, as well as to the countries to the east and south of Turkey. However, precautions have not traditionally been taken when a tandoor is used; therefore, tragic burn incidents have resulted and without changes, will continue to occur. Results obtained in the current study showed that most patients who sustained burns because of falling into a tandoor were under 6 years of age. Although the “tandoor” is confined to a room in a folk museum, it is difficult to stop the use of traditional daily implements, especially in low-socioeconomic areas. However, it should be taken into consideration that improvements in the sociocultural and socioeconomic levels of people in these regions will lead to a decrease in this type of problem. An immediate short-term measure would be to use the media to increase awareness about the importance of using preventative guards with tandoors, which could be helpful in reducing the dramatic effects of tandoor burn-related amputations. There were some limitations to this study the primary one being that it was retrospective and only conducted in a single-center. Adequate data on the percentage and extent of burns and microorganisms growing in the injury cultures of the patients from the records could not be obtained. In addition, this study lacked follow-up data after discharge of the amputees. Our focus was to determine the importance of tandoor burns as a cause of amputations, especially in children. The findings of this study demonstrate that tandoor burns are seen frequently in Eastern Anatolia and that these burns are seen most often in children and in females with low-socioeconomic status. Considering the long-term burden of tandoor burns, in Eastern Anatolia, appropriate measures need to be taken to increase public awareness and to develop protective aids to prevent falls into the tandoor, especially during its active use. In conclusion, tandoor is used in many places in the world for various purposes. Increasing protective measures in the use of tandoor may be useful for reducing the amputations due to tandoor burns and its possible long lifetime consequences. Because, unfortunately, tandoor burns are a significant cause of amputations in children-foot amputations in particular. Smolle C, Cambiaso-Daniel J, Forbes AA, Wurzer P, Hundeshagen G, Branski LK, et al. Recent trends in burn epidemiology worldwide: A systematic review. Burns 2017;43:249-57. Peck MD. Epidemiology of burns throughout the world. Part I: Distribution and risk factors. Burns 2011;37:1087-100. Akarsu S, Durmuş M, Yapici AK, Ozturk S. Psychiatric assessment and rehabilitation of burn patients. Turk J Plast Surg 2017;25:20-7. Goverman J, Mathews K, Goldstein R, Holavanahalli R, Kowalske K, Esselman P, et al. Pediatric contractures in burn injury: A Burn model system national database study. J Burn Care Res 2017;38:e192-9. Leblebici B, Adam M, Bağiş S, Tarim AM, Noyan T, Akman MN, et al. Quality of life after burn injury: The impact of joint contracture. J Burn Care Res 2006;27:864-8. Emsen IM, Yenidunya MO. Clay cooker (tandir) burns. Plast Reconstr Surg 2005;115:654-6. Bekerecioğlu M, Yüksel F, Peker F, Karacaoğlu E, Durak N, Kişlaoğlu E, et al. “Tandir”: An old and well known cause of burn injury in the middle east. Burns 1998;24:654-7. Kut A, Basaran O, Noyan T, Arda IS, Akgün HS, Haberal M, et al. Epidemiologic analysis of patients with burns presenting to the burn units of a university hospital network in Turkey. J Burn Care Res 2006;27:161-9. Akçay MN, Oztürk G, Aydinli B, Ozoğul B. Tandir burns: A severe cause of burns in rural Turkey. Burns 2008;34:268-70. Emsen IM, Oral A, Özcan Ö. Catastrophic and severity burning type among the middle Asia countries “tandoor” burns and its hard complications in our life: Review of 15 years. Eur J Plast Surg 2008;31:299-304. Albayrak Y, Cakır C, Albayrak A, Aylu B. A comparison of the morbidity and mortality of tandir burns and non-tandir burns: Experience in two centers. Ulus Travma Acil Cerrahi Derg 2011;17:323-8. Kösklü Z. Tandir in Old Erzurum Kitchen: How it is Made, Used and Its Place. Eastern Anatolia: Sosyal Bilimler Derg; 2005. p. 2. Yowler CJ, Mozingo DW, Ryan JB, Pruitt BA Jr. Factors contributing to delayed extremity amputation in burn patients. J Trauma 1998;45:522-6. Tarim A, Ezer A. Electrical burn is still a major risk factor for amputations. Burns 2013;39:354-7. Soto CA, Albornoz CR, Peña V, Arriagada C, Hurtado JP, Villegas J, et al. Prognostic factors for amputation in severe burn patients. Burns 2013;39:126-9. Kennedy PJ, Young WM, Deva AK, Haertsch PA. Burns and amputations: A 24-year experience. J Burn Care Res 2006;27:183-8. Li Q, Wang LF, Chen Q, Wang SJ, Li F, Ba T, et al. Amputations in the burn unit: A retrospective analysis of 82 patients across 12 years. Burns 2017;43:1449-54. Li H, Tan J, Zhou J, Yuan Z, Zhang J, Peng Y, et al. Wound management and outcome of 595 electrical burns in a major burn center. J Surg Res 2017;214:182-9. Ablort-Morgan C, Allorto NL, Rode H. Rehabilitation of a bilateral upper limb amputee in a resource restricted burn service. Burns 2016;42:e81-5. Gallagher P, O'Donovan MA, Doyle A, Desmond D. Environmental barriers, activity limitations and participation restrictions experienced by people with major limb amputation. Prosthet Orthot Int 2011;35:278-84. Akansel N, Yılmaz S, Aydın N, Kahveci R. Etiology of burn injuries among 0-6 aged children in one university hospital burn unit, Bursa, Turkey. Int J Caring Sci 2013;6:2. Sarıtaş A, Çıkman M, Çandar M, Baltaci D. Retrospective Analysis of judicial burn cases admitted to our clinic: 4-year experience. Düzce Tıp Derg 2011;13:29-33.
den Hollander D, Albert M, Strand A, Hardcastle TC. Epidemiology and referral patterns of burns admitted to the burns centre at inkosi Albert Luthuli central hospital, Durban. Burns 2014;40:1201-8. Tekin R, Yolbaş I, Selçuk CT, Güneş A, Ozhasanekler A, Aldemir M, et al. An evaluation of pediatric burn patients over a 15-year period. Ulus Travma Acil Cerrahi Derg 2012;18:514-8. Şakrak T, Mangır S, Körmutlu A, Cemboluk Ö. Retrospective analysis of our clinic's burn patients. Turk Plast Surg 2010;18:111-5. Xu JH, Qiu J, Zhou JH, Zhang L, Yuan DF, Dai W, et al. Pediatric burns in military hospitals of China from 2001 to 2007: A retrospective study. Burns 2014;40:1780-8. Shakirov BM. Treatment of sandal burns of the feet in children in a moist environment. Burns 2014;40:520-4.